“Wow, that’s really orange,” I thought. It eclipsed my mood instantly. Back then, I didn’t really snap a lot of abstract art, but MEDIAH started it for me. It would prove to be a beginning of a great discovery. 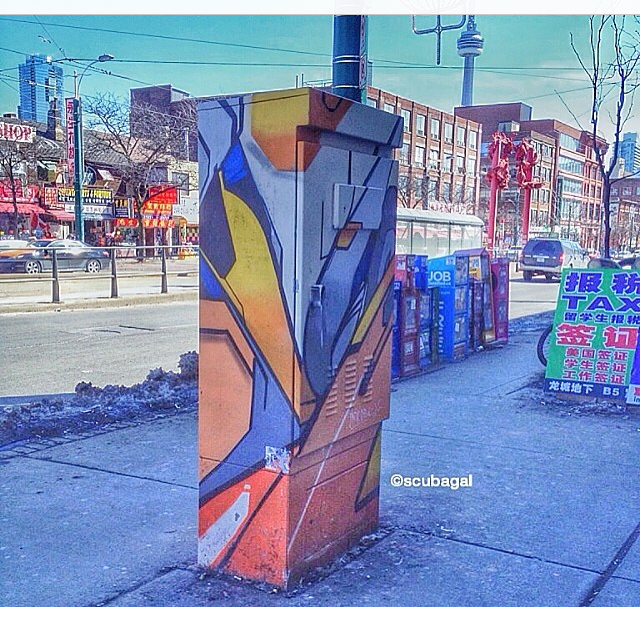 I had the chance to sit down with the Toronto street artist, MEDIAH and discuss some of his art. StreetsNBeats: Now that I found you, could you please tell us a bit about yourself? MEDIAH: My arts background is in digital media and visual effects for film and television. I work out of my own studio IAH Digital doing tons of art projects, paintings, prints and video/film post-production like motion graphics and cutting short promos. StreetsNBeats: I’m not surprised in the least to discover that you have a background in digital media and visual effects. But it is always nice to know that a talented artist is getting paid professionally to do the work that he enjoys. I now know you also are part of the crews (CBS and Hug). But please, tell us a bit about your own art journey. 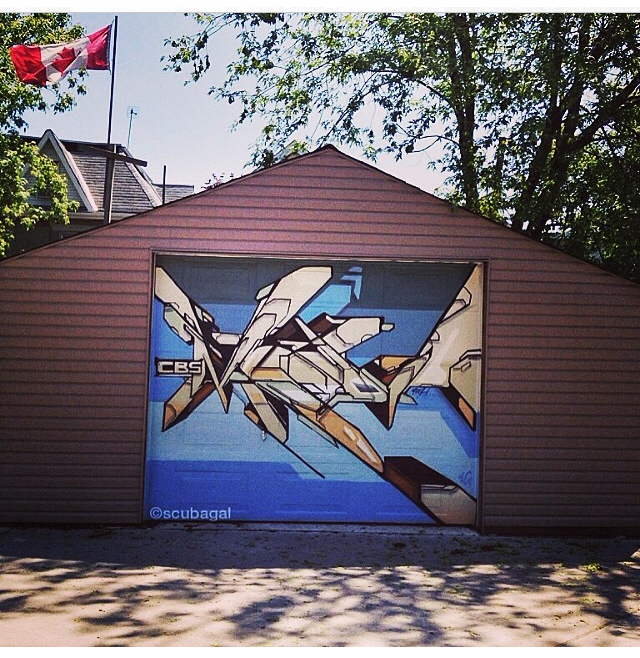 MEDIAH: I started out like a lot of other graffiti writers. I was a teenager deadly curious about a culture that was not publicized and without the internet. Heck, we didn’t even have access to graffiti magazines much back then. Back in 1994 I can only recall one store in Toronto that sold graffiti magazines and that was Number 6 on Queen Street. They were also the first place I found where I could buy German outlines and New York Fats…the only caps (paint) I use to this day. I really had no idea what graffiti was about, who was doing it, nor how it was done. I didn’t even know if it was done using spraypaint or airbrush. I had to find that out the hard way. It really was much trickier coming up as a writer back then. The established group of graffiti writers made sure that the new kids had to fight for their place in the scene….and looking back that was a good thing. I got painted over frequently back then, I mean sometimes within 24 hours. 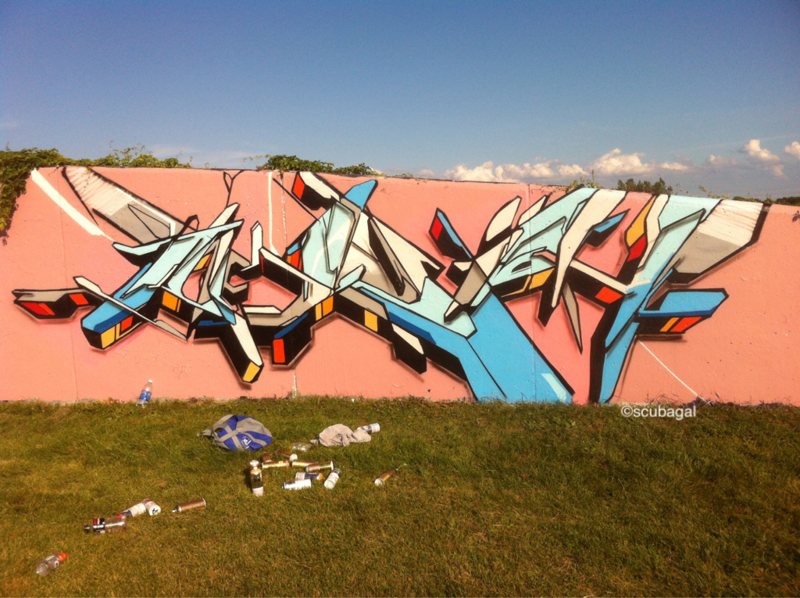 You spend the time painting a burner and you go back in daylight to get a flick and it’s painted over. I had to be persistent and have the resolve to improve at all costs. The Toronto scene has changed like crazy. I think the new writers have an easier time with designer paint being accessible, and then there is Instagram and the internet. Its easier to find reference and skip the “vital” steps. They seem a tad disconnected because of this. In the early days I would find untouched bridges and 18 wheeler trucks outside of the downtown core and do my thing. There was no competition for spots and I could focus on my own development. Trucks will always be first love. When everyone else was painting freights I was on the trailer truck tip. That was my youth in a nutshell. Right now I’m working on building a broader audience for my work. 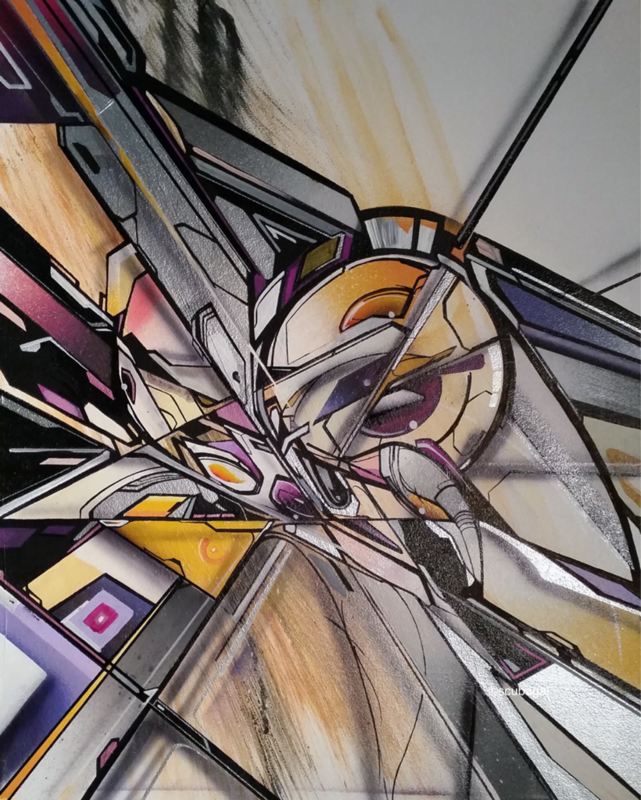 I’m working on merging 3D/Computer Graphics and media art technology with my graffiti heritage to create “immersive media.” I still love to paint walls and do fine art but animation and media art is a major interest for me now. I went to school for Visual effects. Basically 3D animation + digital compositing. Normally that would place me in an animation or production studio but I’m using my skills to create digital fine art. I’m looking forward to doing more projects internationally, whether it be exhibitions, murals or commercial projects. StreetsNBeats: That is quite an impressive start! Do you remember when you got into graffiti specifically? MEDIAH: When I was 15, I would take the Scarborough train from the east end to downtown every Saturday. That line had some of the most amazing graffiti I had ever seen, especially on the Vibe Wall and the east side wall by Lawrence East station. I would stand by the window and stare at the vast amounts of colour and raw energy coming off the walls. I became obsessed with it. I would ask myself who was doing it, and how they did it. I had to find out one way or another. I started drawing my name in blackbooks and note totes (school binders) trying to bend and stretch letters and shapes. I practiced drawing everyday and eventually one night I went out with a can and started tagging my name. MEDIAH’s story begins here. I am imagining riding that train now, sitting and looking out a window. Suddenly I see this wall…picture perfect. StreetsNBeats: You have definitely inspired me over the years, I can’t help but wonder, who inspires you? 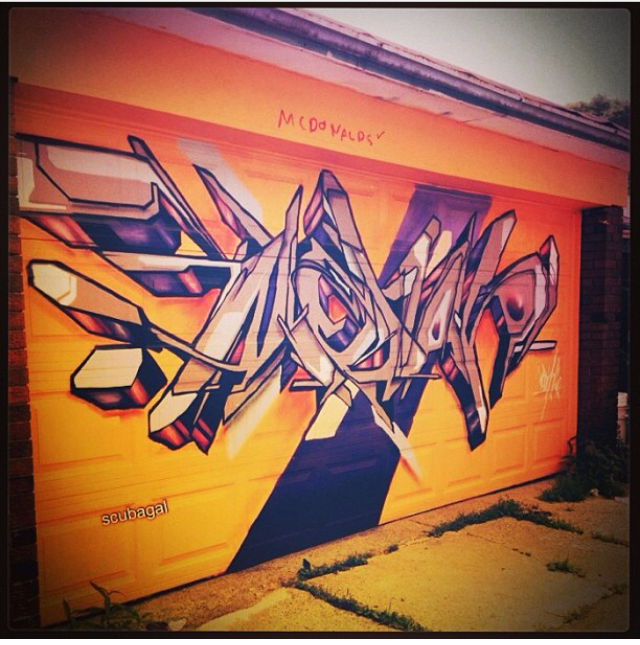 MEDIAH: I admire a lot of artists, both graffiti writers and artists from other genres. 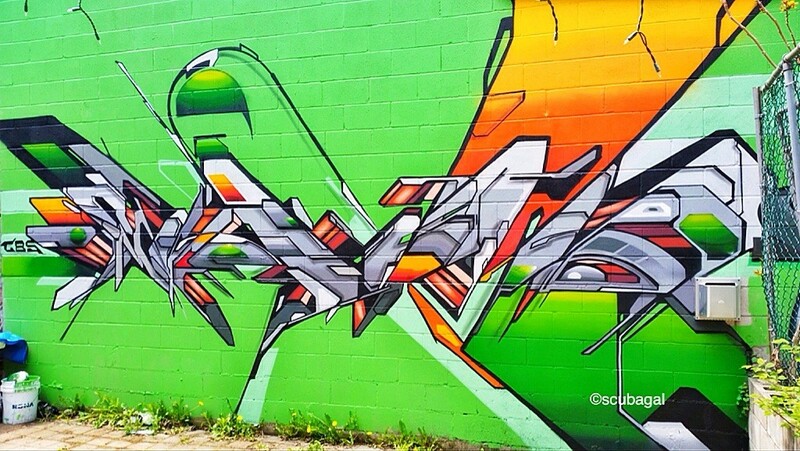 My favourite writers are Ryno, Onur, Plek, News, Stare, Zek, ZMOGK, Sepe and 7seas, just to name just a few. These are the writers that get me pumped when I see their work. I’m also a big fan of artists like Peter Westermann, Brian Scott Hampton, Adam Neate and Li-Hill. These guys are all next level. StreetsNBeats: I have seen a definite evolution of style and grace with your work over the years. Where do you plan on going from here? MEDIAH: Immersive media. Creating experiential artwork that incorporates mural artwork, projection, and animation so that it’s seamless. I want to create interactive cinema using holographics (when the technology is made available). I want to bring my visions to the next level, breaking out of static artwork into truly dynamic work. I’m also working on a new catalogue of paintings, prints and fine art. StreetsNBeats: Thank you so much for our interview! Any parting tips for graffiti artists starting out? MEDIAH: YUP. BE ORIGINAL. Get your inspiration from sources OUTSIDE of graffiti. Don’t be afraid to try and learn new things. Establish yourself as an official graffiti writer using freehand spraypaint before you start painting murals with brushes so you don’t get dissed and labelled. Wear a mask ALWAYS! !